Pet cremation as a business has developed rapidly over the past decade. The developments in technology reflected in the professional approach that businesses now take has become a growing £100+ million pound a year industry. Pets are increasingly important in the lives of their owners who now expect as respectful a send-off as for a family member. This has led to the increase in professional pet crematoriums. This latest installation by Addfield Environmental Systems recognises yet another first in the industry. What has made this different is that it is not being run by a business or an individual but by a Borough Council. The first council run pet crematorium in the UK has been launched by Barnsley Metropolitan Borough Council providing who will be delivering a highly professional service utilising the expertise of their own bereavement teams. The service will be fully self-sufficient being able to be raise revenue, and a genuine benefit to the people of Barnsley. The machine which was selected was a PET-200 pet cremation machine supplied by the industry leaders in pet cremation solutions, Addfield Environmental Systems. Chosen because of the efficiency, adaptability and reliability of the operational process. The machine which has become the most popular solution throughout Europe due to its ability to be securely installed in almost any location. 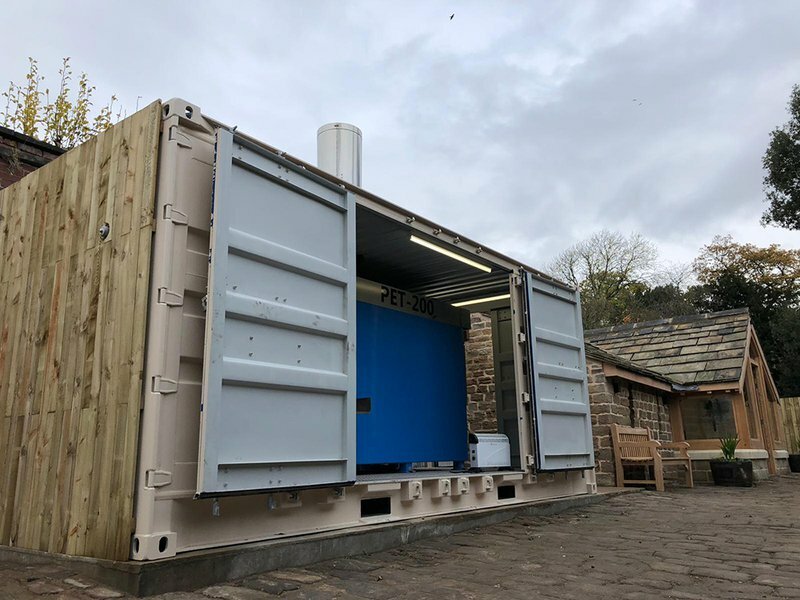 Due to the unique and idyllic nature of Canon Hall where it is to be operated from, it has been housed in a specially adapted container, custom finished to blend seamlessley into the surroundings. “This is a great opportunity for Barnsley Metropolitan Borough Council to provide a service to their community. This is the first council that we know of that has invested in pet cremation and it really reinforces the growth of the industry as a viable business model. We have seen constant growth in pet crematoriums during the past few years and have expanded our range to meet demand. We are sure that following the success that Barnsley Metropolitan Borough Council will have more councils will realise the potential in providing this service for their residents. It’s a real credit to the industry, what has been achieved here, a really beautiful location where the council has made a real effort to not only provide a service but also to have made it so comforting and in keeping with the surroundings. We are really proud to have been a part of this project.” Derek Carr, Operation Director. 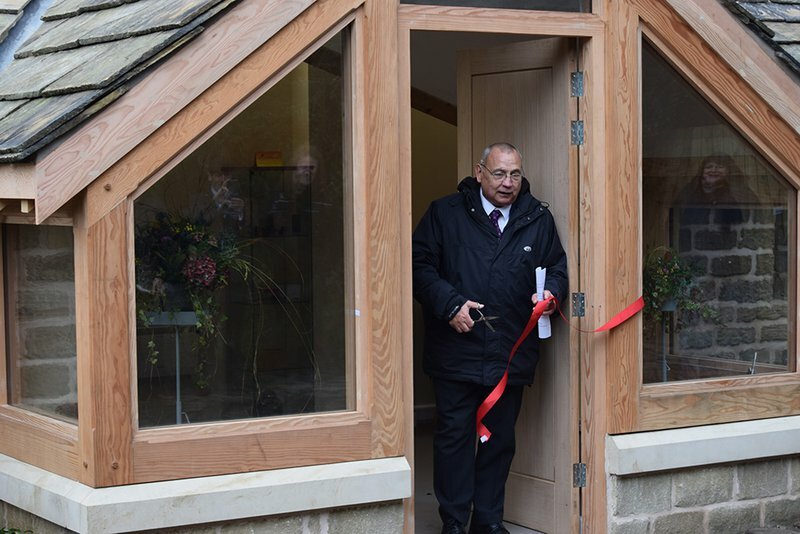 “Today we see the opening of a new facility here at canon hall, one which will provide a very sensitive and caring service to those that have lost a much-loved pet. We believe we are the first council in the country to build and operate a pet crematorium. Our services will work and pay for itself, putting the money back into the services. This is a very nice place for people to walk their dogs, they are used to coming here and having the facility onsite they can come in here see the way we will deal with their pet. This facility has been created to work well and blend in with the old slate and the background of canon hall itself. A big thankyou to Addfield Environmental for all the work you have done with us. We have already had people ask us when they can bring their pets as this is the first facility in the area, with the next nearest being in Doncaster which is a long way to go to.” Councillor Roy Miller – Cabinet Spokesperson – Place – Barnsley Metropolitan Borough Council. This launch in Canon Hall sees the blossoming of a project more than two years in the making. Addfield worked side by side with Barnsley Metropolitan Borough Council to ensure that they provided the right solution to meet the needs of the community as well as ensuring to maintain the natural beauty of the surroundings. Having carried out multiple visits between Addfield Manufacturing facility in Staffordshire, various pet crematoriums in the UK and to Canon Hall. The teamwork between organisations has culminated in the smooth opening of the service this November.